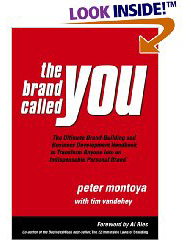 Peter Montoya is the author of the book, “The Brand Called You.” He believes, as do I, that the primary step toward building a successful business relationship is to build a personal relationship at the same time. He is so good at doing it in fact, that he was able to develop a relationship with me over the course of just three days … before he ever knew I existed. Here’s how he did it. I first learned of Peter Montoya at the Boarders Books store near my home. As I was browsing through the business section looking for an interesting guest to interview for my marketing show, “The Brand Called You” jumped off the shelf into my hands. “If you want to influence how people see you,“ Peter wrote in Chapter Four, “you must tell a story about yourself that makes the reader come away as if he or she knows you.” I was hooked. I walked to the checkout counter with Peter’s book in hand. Over the next three days he answered hundreds of question I had concerning personal branding. He also made dozens of suggestions as to how I could incorporate those ideas into my business. His answers were straightforward and simple; yet somewhat foreign to the way I had been doing business most of my life. Early on for example, he suggested that one of the best ways to build a bond with a potential customer was to share something personal. Could something so simple and contrary to everything I believed about business really make a difference I wondered? A few days later I called Peter on the telephone to ask if he would like to be a guest on the Recognized Expert Marketing Show. Within three seconds of him answering the telephone, I had the answer I was looking for. Here’s what happened. Bob: Hi, may I speak with Peter please? Receptionist: Certainly, may I tell him who’s calling? Bob: Yes. Please tell him Bob Sommers is calling? Receptionist: Of course. Just a moment Mr. Sommers. Peter: Hi, this is Peter Montoya. Bob: Peter, buddy, this is Bob Sommers!!! How are you?!!! Peter: I’m fine. (silence) I’m sorry Bob, do we know each other? Bob: (After realizing that Peter Montoya had no idea who I was.) Oh Peter I’m sorry. You don’t know me. I just finished reading your book but I feel like I’m calling one of my friends. How embarrassing. Peter: Please don’t be embarrassed Bob. If anything you’ve just given me a great compliment. It sounds like the personal branding I wrote about in my book worked just as I intended. Thank you. You bet it worked. It worked so well that for the first five minutes we talked about his mom Denise, his brothers; Mathew, Mark, Luke and John; his wife Lynn and his two dogs Maxine and Molly. We laughed, we joked and chuckled at our similar experiences growing up Catholic. And all the while I was getting more and more comfortable with him because we had these things in common. Study after study shows that we like people who are like us? The thought process goes something like this. If I like me, and you’re like me, I must like you too. From there it’s an easy transition to; if I trust me, and you’re like me, I must trust you too. Had Peter not taken the risk to tell me, his reader, something personal about himself, our conversation would not have been the same. Peter made it easy for me to start and carry on an intelligent conversation by giving me the fodder about himself that I would not have had otherwise. It is so easy to divulge something personal about yourself on your blog or website, but most of us don’t do it. We don’t do it because we think it isn’t appropriate. My own experience tells me otherwise. Writing about yourself isn’t for your benefit; it’s for the benefit of your customers and prospects. I implore you to make it easy for them to get to know you, like you and trust you. Take a moment and tell the world something about yourself that makes you human. That’s where relationships … and sales begin. If you get an opportunity, I welcome you to get to know me. I assure you my “about me” page isn’t like any other professional “about me” page you’ve seen before. And then go to the comment section and tell me what you think.